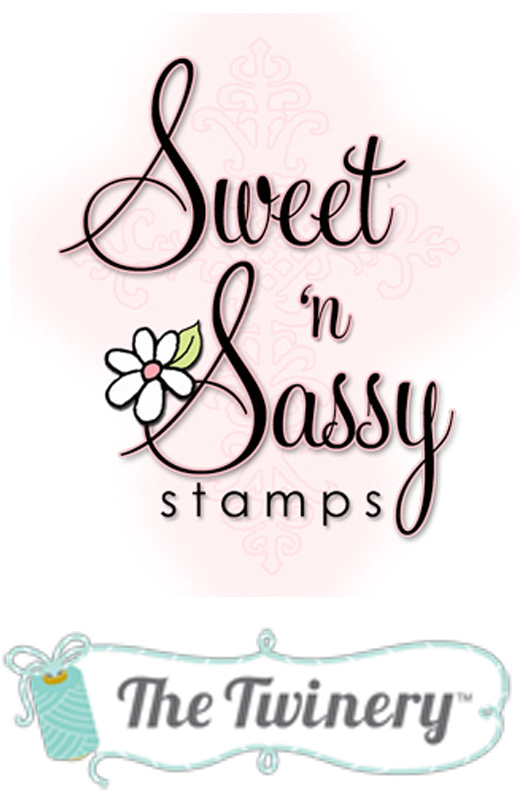 Next month, Sweet 'n Sassy Stamps will celebrate their 4th birthday. The whole month will be filled with Sweet Peeks, new releases, blog hops, fun prizes, and shopping discounts! You won't want to miss out on the fun, so check out the Sweet 'n Sassy Stamps Forum at Splitcoaststampers for all of the information on upcoming events! With that in mind, my Sweet Stop sample this week is a birthday card made with this adorable new digi image of the infamous Cocoa..."Cocoa's Candy Apple." Creative Nugget: As we end the month of October, SSS131 is a repeat of sketch 77, our last blast from the past. This is a perfect sketch for using up those left over scraps of designer paper. 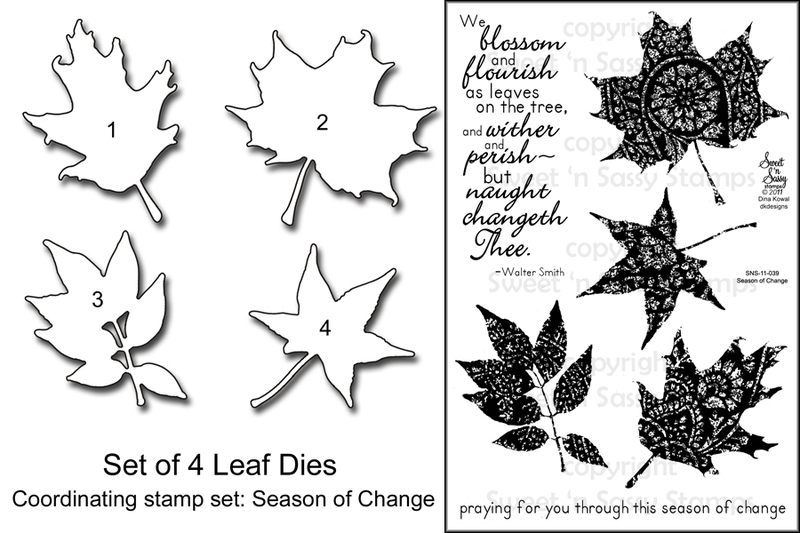 The card and the autumn colors were inspired by this week's Inspiration Challenge photo over at the SNSS forum at Splitcoaststampers. Cocoa and the yummy caramel apple were colored with copic markers. A heavy layer of Glossy Accents was added to make the caramel on the apple look creamy. The image and all the matting layers were die cut with Nestabilities. The "Max and Whiskers" DP by Basic Grey provided the perfect fall palette for all the layers on the sketch. The Fine Linen sentiment panel was given some texture with my favorite canvass impression plate. Everything was mounted on a Fine Linen card base. The Maraschino twine was distressed a bit with Walnut Stain distress ink and wrapped around the card. A few buttons, twine, and carnation creations die cuts were added to finish this sweet birthday card. Check out the other awesome samples by the Sugar Babies over at The Sweet Stop! On a different note, this new little bundle of golden fur has completely upset our daily routine...not that I'm complaining mind you! We've had Kody, who turned two months old yesterday, since last Friday. 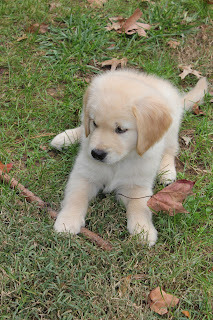 His antics keep us laughing, and it's a good thing because waking up every three hours has me exhausted, but our crate training is going very well as Kody seems to be a quick learner...praise the Lord! 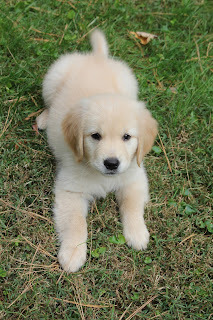 I'll keep you posted occasionally as Kody grows and keeps us on our toes! What a cute fur ball! Thanks for stopping by today! Enjoy your weekend...and for those of you in the east...the SNOW!! Happy Saturday to you, my friends! Have you noticed all the pink challenges out there in blog land this month? Breast Cancer Awareness is the reason for all the pink during the month of October and here at The Sweet Stop, we've decided to join the crowd. Not only are we revisiting SSS69 from the past, but we are all using pink for our samples! Creative Nugget: I flipped the sketch to accommodate this little Mo Manning cutie which was colored with copic markers. Some Diamond Stickles were added to the dandelion puffs, parts of her outfit, and her ponytail band. While still in the rectangle nestie, Antique Linen Distress Ink was sponged around the border. This was attached to a True Black Spellbinders label twenty-three die cut. All of the pretty "My Mind's Eye" papers were layered on True Black. These were then adhered to a Pink Pirouette card base. A border was punched from the same "My Mind's Eye" paper as the background and then layered on black. Charcoal and Blossom twine was also wrapped around the three pink gingham panels. The greeting was mounted on several matching circle punches and covered with a page bubble. Pearls were colored to match and stuck on the border to finish the card. Hope you like my pretty pink sample! 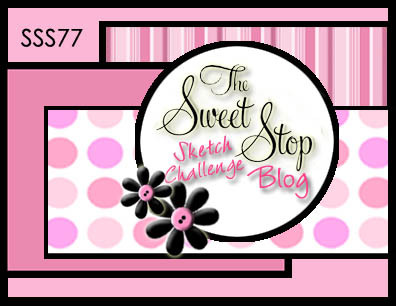 Now check out the other fabulous samples by the Sugar Babies Team and join the SNSS131 sketch challenge over at The Sweet Stop! Speaking of making a wish...one of mine came true today. 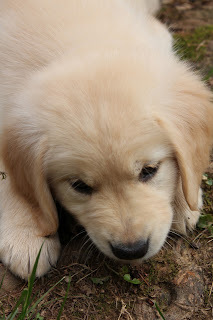 We have a new member of our family...a sweet little golden retriever puppy! I'll have pictures on my next post! Hope you all have a wonderful weekend...stop back again! & The Twinery Blog Hop! Twinery twine and Sweet 'n Sassy Stamps is a match made in heaven as you will see as you travel to each of our bloggers today. As you make your way through the hop, be sure to leave a comment on each blog to be eligible for prizes, one from each company. Two lucky winners who leave a comment on each blog on the hop, will be selected by random. The deadline to hop and leave comments is 11:59 EST Saturday, October 22nd. The winners will be announced on Sunday, October 23rd on the Sweet 'n Sassy Stamps Blog and The Twinery Blog. So grab a cuppa and relax as you hop through the fabulous list of bloggers to see projects that combine twine with Sweet 'n Sassy stamps! If you've arrived here from the amazing Bridget Finlay...you're on the right track! If not, you may want to head back to The Twinery Blog where the hop begins. 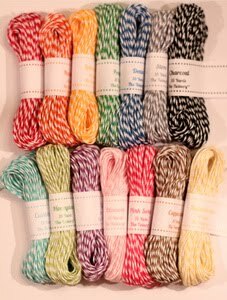 Sweet 'n Sassy clear stamp set, "Gobble, Gobble" and Caribbean, Lemondrop, Peapod, and Cappuccino twine from The Twinery. After coloring the turkey with copic markers, twine was stitched to his tail feathers. This was cut out with a label die from Papertrey Ink and sponged with Antique Linen, Walnut Stain, and Broken China Distress Inks. Clouds were sponged on the background with Broken China. The ground is a torn piece of DP from the Forever Fall Collection by Bo Bunny. Faux stitching was added around the perimeter. The fence was textured with a wood grain impression plate before being die cut with a fence die, both from Papertrey Ink. The pennant was punched with a Stampin' Up! pennant punch, stitched together with twine, and stamped with several sentiments from the "Gobble, Gobble" stamp set. This was all layered onto an Early Espresso panel and attached to a Vintage Cream card base. A button and pearl accents finish the card. 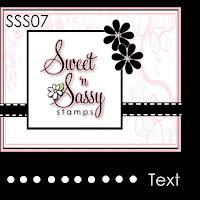 I think you'll agree that Sweet 'n Sassy Stamps and The Twinery is a fabulous match! Thanks for stopping by today...enjoy the hop! Don't forget to leave your comment before heading off to Katrina Hunt for another wonderful sample! It's Saturday again and time for another sketch from The Sweet Stop! We're continuing our "Blast from the Past" theme with sketch 26 this week. Since it's the third week of the month, the spin on this sketch is "Let's Recycle." 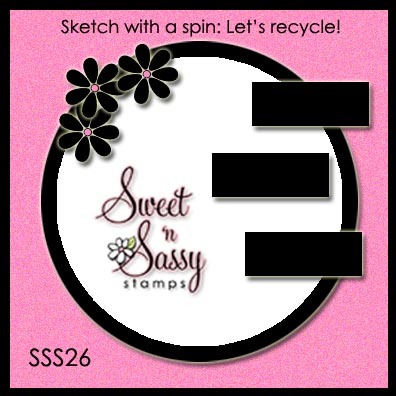 Reuse something on your card and have a chance to win a $10.00 gift certificate to the Sweet 'n Sassy Stamp Store! So...let's get started! Creative Nugget: My sister-in-law found this old Thanksgiving program at an antique store and thought I might be able to use it, so I decided to recycle it. The background on my sample card was cut down from the front of the program. The perfect image to use on a Thanksgiving card is this cute turkey from Sweet 'n Sassy's "Gobble, Gobble" clear stamp set. The Pilgrim turkey is colored with copic markers and cut with a circle Nestie. This was put on a black circle and then a Pure Poppy Floral Doily Motif. The turkey panel was popped up on a Fine Linen card front with a feather tucked behind it. I stamped the "Gobble, Gobble" sentiment several times, cut it apart, and mounted it on the card front as well. Black rhinestone stickers were added to the corners of the card. Now it's your turn to find something to recycle on your card. Upload your creation for SSS130 using the linky tool at The Sweet Stop...we love to see your cards each week! Check out the other Sugar Babies for more inspiration! Happy Saturday to you, friends! As you read this post, I am so excited to be at the Heirloom's York Rubber Stamps & Paper Arts Festival with Sweet 'n Sassy Stamps! If you're any where close to the York Expo Center in York, PA, I hope you can join us there. There are over 25 festival exhibitors, ample parking, food service, and door prize drawings! 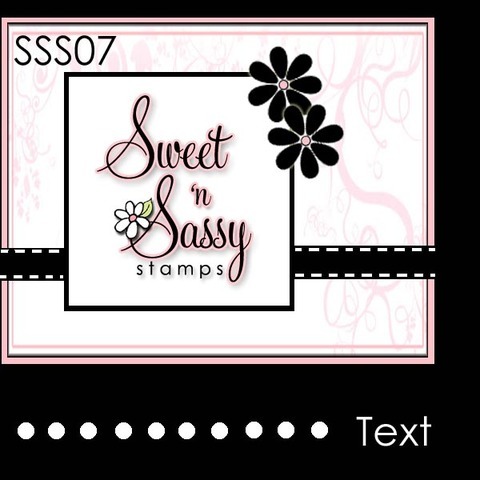 In addition, if you go to the Sweet 'n Sassy forum over at Splitcoaststampers, you will find a coupon for a 10% discount on your entire purchase at the Sweet 'n Sassy booth! Fun, Food, and a chance for Free stamps...how awesome is that! Now...on to the Sweet Stop sketch challenge. We are continuing on with our "Blast from the Past" theme this month, and this week we are repeating sketch 37. 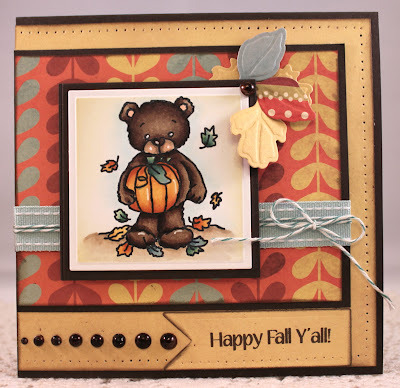 Creative Nugget: For my sample this week, I went with a fall theme using a beautiful image from Sweet 'n Sassy's "Autumn Bounty" clear stamp set. The image was colored with copic markers and given some glittery highlights with a jelly roll pen. The gorgeous fall papers are from the "Forever Fall Collection" by Bo Bunny. The doily is Cheery Lynn's English Tea Party doily die...LOVE this die! Some Baker's twine was threaded through the doily before it was adhered to the DP layer. All the layers were heavily sponged with Walnut Stain Distress Ink and mounted on a Bermuda Bay card base. The little leaves in the corner are die cut with Spellbinders Foliage Shapeabilities dies. A button, pearls colored with a copic marker to match, and ribbon accents finish the card. Now it's your turn...grab your stamps, follow the sketch, and upload your card using the linky tool at The Sweet Stop. For more inspiration, check out the other Sugar Babies' samples. Thanks for bearing with me as I get accustomed to a new computer...switching from a PC to a Mac will take some getting used to! Hope everyone had a wonderful week! Welcome back for another Sweet Stop sketch. For the month of October, we'll be taking a look at some fabulous sketches from the past, so for the next five Saturdays, get ready to play along with this "Blast From the Past!" Creative Nugget: Since it's the beginning of October, I decided to go with an autumn theme for my sample, and who better to celebrate the beginning of a new month in fall than Rhubarb! This image is from Sweet 'n Sassy's "Rhubarb's Autumn Joys" stamp set. Rhubarb was colored with copic markers, cut with a square nestie, then mounted on an Early Espresso layer. 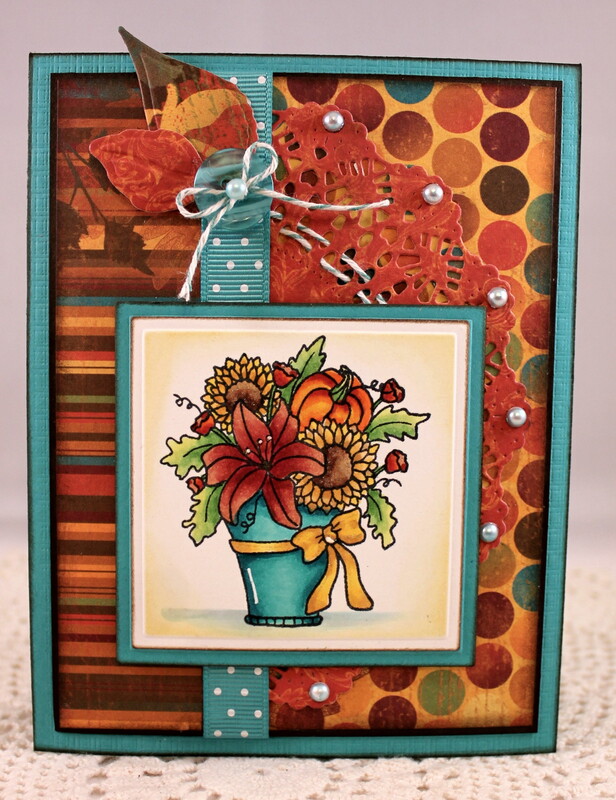 The designer papers used for this card are from Grandma's Kitchen by Were Are Memory Keepers. The pattern reminded me of falling leaves and I thought it would be the perfect background to match the falling leaves in the image. All panels are attached to an Early Espresso card base. 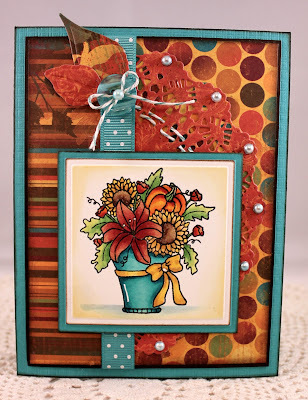 The corner leaf accent and the sentiment banner are both Spellbinder dies. The pearls, descending in size, some piercing, double stitched ribbon, and Baker's twine finish the card! This design is one of the very first Sweet Stop sketches from the past, so I hope you'll check out the samples by the other Sugar Babies and play along with us this week! Thanks for visiting with me today and have a fabulous weekend!